In a brief description to those who are not familiar with Naruto, here is a summary of his adventures of becoming a true shinobi and a Hokage (leader) of his village. The main character named Uzumaki Naruto grew up in a village called Konoha where a decade ago, the spirit of a demon fox was sealed to his body by the former fourth Hokage of Konoha. As he grows up, everyone hates him because of the demon fox inside him that almost destroyed their village. He lived his life without friends. 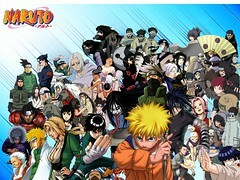 But it doesn't stop Naruto to overcome obstacles and become a great ninja. That made him more motivated to prove to everyone that one day he will become a great Hokage of Konoha and finally acknowledge his own abilities.